From L-R: Micheal George, Mitch Burke, Sean Kelley and Kevin George. 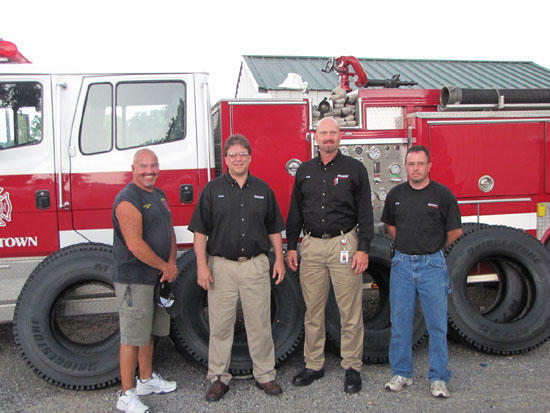 The Mooretown Volunteer Fire Department received a gift Monday of eight over-the-road truck tires for one of the fire trucks. Ambassadors from the Bridgestone Tire Company in Warren County donated these tires to the department. Fire Chief Micheal George tells the Courier that this will give the department new tires on 100% of the equipment that they use. Mitchell Burke of Cannon County, along with Plant Operations Manager Sean Kelley of Warren County were on hand to present these valuable tires to the department. Kevin George also works at the Bridgestone Plant and was instrumental in procuring these tires. Mooretown volunteer fire department is located on Hollow Springs Road in the 3rd district of Cannon County in which Kevin George serves as one of the commissioners representing the 3rd district. The cost of the tires on the market is $500.00 a piece, Kelley says that the tires could last an over- the- road truck up to and over 80,000 miles. Which means to the department the tires will probably dry rot before they wear out?